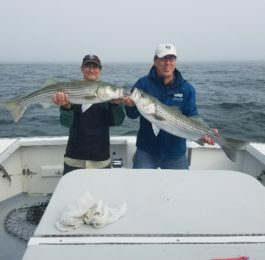 Sport & Family Fishing Charter out of Bass River, Cape Cod, MA. 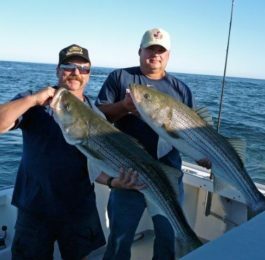 Captain Mike Harney has been fishing Cape Cod waters his entire life, working his way up from a 20′ center console to the EmmaJack the 35′ Young Brothers he has today. In that time he spent many summers commercially fishing for Bass and Tuna, perfecting his skills as a fisherman. 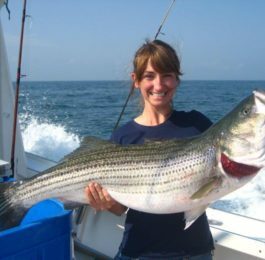 The EmmaJack is docked in Bass River and fishes the rips at Monomoy, up to Chatham and down to Nantucket for Bass. Contact Captain Mike at mwharney@msn.com or click on Book Now below and fill out the form. • F/V EmmaJack 35″ Young Brothers full electronics and safety gear • Heated wheelhouse, Head • Rod reels bait & tackle • Fish will be filleted and bagged for you. • Max 6 anglers, multiple boat charters can be arranged. 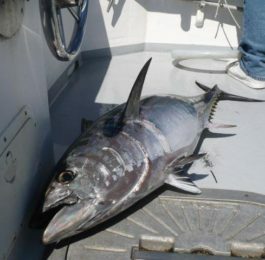 • 4, 6, or 8-hour trips *No individual saltwater fishing liscense required. Things to bring: Food/beverages, Camera, extra outerwear, cooler for fillets, sunscreen and sunglasses. The EmmaJack is a very comfortable, safe, dry down east style boat. She cruises at 17 kts. has a full heated wheel house to get out of the weather, a head, and full safety equipment including a 6 person raft, EPIRB and Type 1 lifejackets. She is a very stable boat to fish from which makes it a great trip for families with children! We had an awesome time fishing with you, we have only great things to say about you and the fishing trip!!!! Thank you so much… oh we tried recipe #3 the very night we got back from the trip. Pos-a-lutely delicious!!! Contact us now to book a trip! Simply click on the Contact Us button and fill out the Trip Form. We will be in touch as soon as possible!